The Harvard Club of Japan is pleased to announce the Tokyo premiere screening / listening of Dreams of a Sleeping World, the debut symphonic recording album by Chad Cannon, Harvard Class of 2011. Scored for woodwind soloists, choir, orchestra, and organ, this hour-long work explores 10 paintings from the fantastical world of Japanese-Brazilian artist Oscar Oiwa. 9 of the paintings are paired with poems from Tibet/China, Nepal, Vietnam, Japan, India/Bangladesh, and the USA, most of which are reflections on calamities (war, natural disaster, political upheaval, income inequality, etc. ), experienced by the authors themselves. The piece was premiered by the Slovenia Philharmonic in 2017. This new recording features Los Angeles Philharmonic clarinet soloist Andrew Lowy (Harvard Class of 2009) and the Hollywood Studio Symphony under maestro Vladimir Kulenovic. The evening will feature a "cinema version" of the album, with ultra-high-res images of Oiwa's paintings projected together with the poetry onscreen in a cross-disciplinary, multimedia experience. *Special guest Sayo Kosugi (co-founder of the Asia / America New Music Institute, AANMI) will open the evening with a short presentation of her work on a beautiful film about Kyoto's autumn leaves. Chad Cannon is a composer interested in the intersection of cultures, history, and human stories. 美国工厂 (2019 Sundance Film Festival premiere and award winner), Cairo Declaration (co-composed with Xiaogang Ye), and CyberWork and the American Dream (PBS). 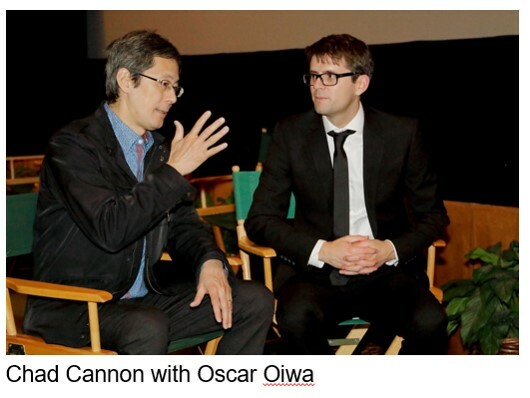 The Dreams of a Sleeping World, a symphonic work based on 10 paintings by Oscar Oiwa, was recorded by the Hollywood Studio Symphony after its 2017 Slovenia Philharmonic premiere. Fluent in Japanese, Chad works with composer Joe Hisaishi, acting as chief orchestrator and arranger for Joe Hisaishi Symphonic Concert: Music from the Studio Ghibli Films of Hayao Miyazaki, which has seen sold-out performances in Melbourne, Paris, Brussels, Lyon, Los Angeles, San Jose, and New York City (Carnegie Hall). Chad has also orchestrated on major blockbuster Hollywood films such as The Hobbit, Godzilla, Secret Life of Pets (1 and 2), and Guardians of the Galaxy, Vol. 2. Chad worked closely with violinist Midori on her charity projects, having produced 8 concert tours in Asia. He holds degrees from Harvard and Juilliard. In 2013, Chad founded the Asia / America New Music Institute (AANMI), which supports cultural exchange through new music concerts. He has led programs in China, Thailand, Vietnam, Korea, Japan, and across the United States, featuring some of the region’s best talent, including Ryu Goto and Kojiro Umezaki. AANMI’s 2018 Japan Concert Tour saw performances at Tokyo’s Suntory Hall and World Heritage sites such as Nijojo Castle in Kyoto. AANMI’s debut recording Transcendent was released in 2018, receiving critical acclaim in Gramophone.